Fellow Utah birders have been reporting a pair of Surf Scoters being seen from the Antelope Island Causeway. 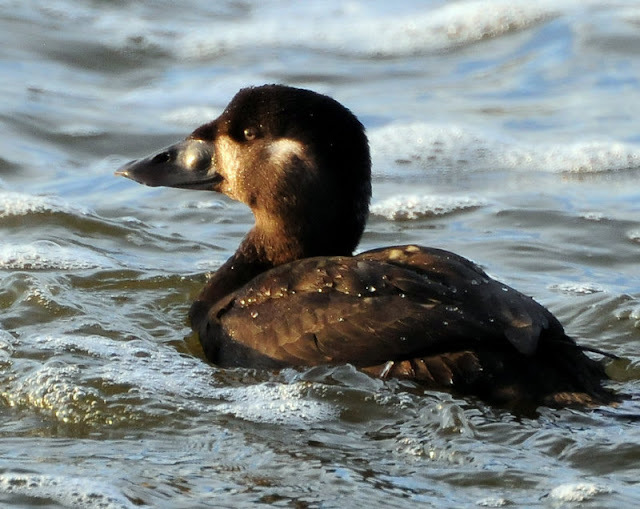 While Scoters do make their way into the interior west every year, I have repeatedly dipped on them....until today! Paul Higgins' photo above is from Nov 2008, also taken at the Antelope Island Causeway. The two birds I saw today are in the exact same plumage. Silly me, I had forgotten my camera memory card. The two Harlequin Ducks are still at the Causeway too. By the way, I've never really known how to pronounce "scoter". When I was first getting into birding, I would read it in the field guide and say in mind "scooter" - like the mini-motorcycle. Then I started saying SKAH-ter. Good ol' Merriam-Webster gives pronunciations online and says SKOH-ter (listen here). Had I really thought about it, I should have been able to figure it out on my own. After all I have elementary school aged kids. The "e" after the "t" makes the "o" say its name. 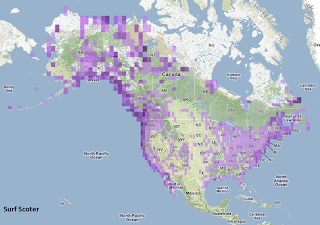 Checking in on my 2011 Birding Goals...I'm still averaging at least one eBird checklist per day, which is good. Thanks in large part to my trip to the Midwest Birding Symposium, I have added 32 life birds this year, surpassing my goal of 20. My final goal was to get to 150 Utah birds. I easily achieved that goal and as of today I've seen 203 bird species in Utah. Very cool. Did you name him Scooter? Congrats! Did you do your lifer dance like you did at Magee?